Puerto Ventanas S.A. is born as an independent company and subsidiary of Gener S.A.
Puerto Ventanas S.A. becomes proprietor of all the facilities in land and sea on the port, after a process of acquisition. With the beginning of operations of Sites N° 4 and N°5, the extension of the pier is inaugurated, increasing the capacity to perform maneuvers. A warehouse is built to receive and store over 45 thousand tons of clean bulk. It connects to site N° 5 through an automated system of conveyor belts, achieving a cargo loading and unloading output of 18 thousand tons per day. During the first semester, fixed assets of Petróleos, Asfaltos y Combustibles S.A. (PACSA) are acquired, as well as a share of 99.99% of the society ACSA Agencia de Naves S.A.
After a year of construction, Empresas Melón inaugurates a clinker storage dome. It connects to site N°5 through a pipe conveyor belt to handle material in a confined space. AES Gener S.A.’s stocks of Puerto Ventanas S.A. are acquired by SK Inversiones Portuarias S.A. and another 11 companies, after signing a shareholders agreement. Se inaugura la bodega, construida por Puerto Ventanas S.A., para el almacenamiento d concentrado de cobre de la ex Compañía Minera Disputada de Las Condes, hoy Anglo American. Sigdo Koppers S.A. purchases 5.18% of stocks of Puerto Ventanas S.A., and SK Inversiones Portuarias increases its share to 43.03% in the corporate structure. Puerto Ventanas S.A. buys 51.82% of A shares from Ferrocarril del Pacífico S.A. (Fepasa). By increasing its share of Puerto Ventanas S.A. to 6.98%, Sigdo Koppers S.A. increases its joint participation with SK Inversiones Portuarias S.A., to 50,01% of the ownership of Puerto Ventanas S.A.
Construction of a new warehouse for Anglo American begins with its engineering studies. It has a storage capacity of 60,000 tons of copper concentrate and includes the latest environmental technology. A pet coke storage yard for ENAP Refinerías S.A. is put into operation. The company undergoes its ISO 9001:2000 certification for Port Quality Management System. The company agrees with Anglo American to sign a 25-year deal to store and ship copper concentrate from Los Bronces mine expansion. Anglo American’s copper concentrate warehouse ends its construction and begins operating, increasing the company’s warehouse and cargo capacity considerably. With workshops for the community, the Puerto Abierto de Puerto Ventanas S.A. community center begins its operations. It is a nonprofit corporation with the objective of contributing to the cultural development, quality of life and the overall wellbeing of the Puchuncaví community. Puerto Ventanas S.A. sells the oil terminal and mini tankers for US$MM 29.45. After an exhaustive verification process, Puerto Ventanas S.A. certifies its Integrated Management System, including ISO 9001 (Quality), ISO 14001 (Environment), OSHAS 18001 (Health and Occupational Safety) and the crime prevention model. The new corporate building is inaugurated in port. The first evaluation and certification of Puerto Ventanas S.A.’s environmental footprint are undertaken. The company is the first in the country to report to HuellaChile, an initiative from the Chilean Ministry of the Environment to manage greenhouse gas emissions in large and small institutions. The Chilean National Council for Safety awards Puerto Ventanas S.A. for having the lowest accident frequency rates in 2014 under the Port category. It also receives ASIVA’s 2015 Safety award. It is the first port in Chile to create a Joint Committee. The Regional Chamber of Commerce of Valparaiso (CRCP) awards Puerto Ventanas S.A. with the 2015 Corporate Social Responsibility award. The construction of a new warehouse for solid bulk begins, as well as the project to expand, improve and modernize the shipping system for copper concentrate, known as Site N° 3. A Chief Sustainability Office is created to deal with the growing challenges for the environment, safety, and quality. Puerto Ventanas S.A. is awarded recognition by the Chilean Institute of Occupational Safety (IST) for a year without lost time accidents. The Energy Efficiency and Certification ISO 50.001 is awarded. Puerto Ventanas S.A. becomes the first port in Chile to entirely end with the temporary worker's regime, after a running a permanent worker hiring process through its subsidiary AGMAC. 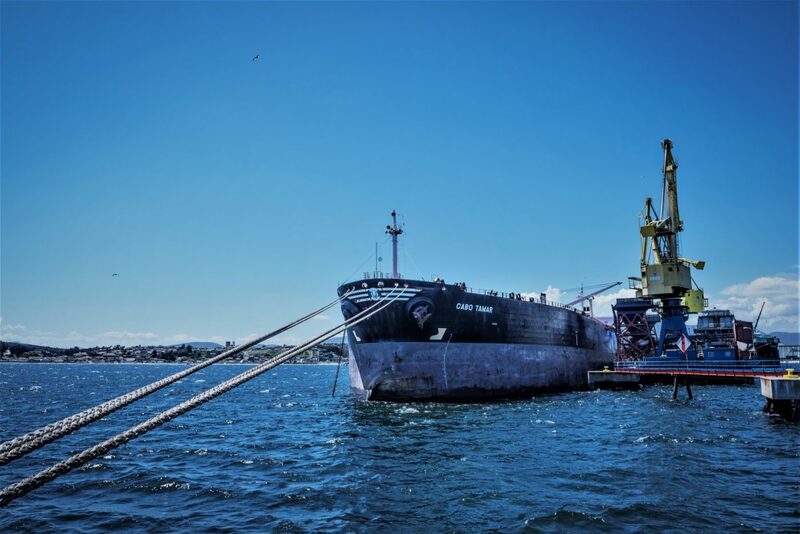 Puerto Ventanas S.A. prepares the first Guide of Best Practices in Solid Bulk Management, with the Valparaiso Region’s environmental authority. Puerto Ventanas S.A. is awarded ASIVA 2016 Security Award and the Excellence in Risk Management Award given by the Chilean National Council for Safety. The project to expand, improve and modernize the copper concentrate shipping system begins. It is a new transferal system located in Site N° 3 of the port, it will have over 1,100 meters of sealed conveyor belts, and will incorporate a mobile loader with a capacity of 1,500 tons per hour. Puerto Ventanas S.A. is given the European EcoPorts certification. It becomes the first port in Chie to be awarded. The award was created exclusively for the port industry, in recognition for the terminal’s sustainability and high operating standards. The assembly of the project to improve and modernize the shipping of copper concentrate concludes at the end of 2017. In April, ASIVA’s prize for Industrial Development is awarded. In October, the Regional Chamber of Commerce of Valparaiso grants the Corporate Social Responsibility Award. In November the Gold Seal for Energy Efficiency is granted. In December, the Maritime Award of the Americas in the category Green Ports is given, as a recognition from the Organization of American States’ Inter American Committee on Ports.